It’s tough to decry any kid leaving school early to pursue a professional endeavor. It’s even tougher to decry that kid when he’s risking millions to actually come back to school. And above else, it might be even tougher to come up with a list of reasons for a kid to stay in school when they’ve often been already been offered exactly what the rest of the student body is so fervently in search of — a job. Now E.J. Singler wasn’t exactly a candidate to forgo his final year of eligibility, but the point is this: No player, anywhere, in the NBA can win an early January game and, be this excited and then get greeted with the same raw, unfiltered happy emotion by fans that paid exactly zero dollars to come watch him play. The Princeton Offense (…cough… Lakers…cough), the full court press, John Calipari and Bill Walton’s Misinformed Campus Tour might not translate anywhere in the NBA either, but none of those are particularly enjoyable things at the college level. Sharing a win over an over-ranked No. 4 Arizona team on January 10th, at home, on national television, with the same fans that rattled the oppositions cage? That would fall under the “particularly enjoyable” banner. 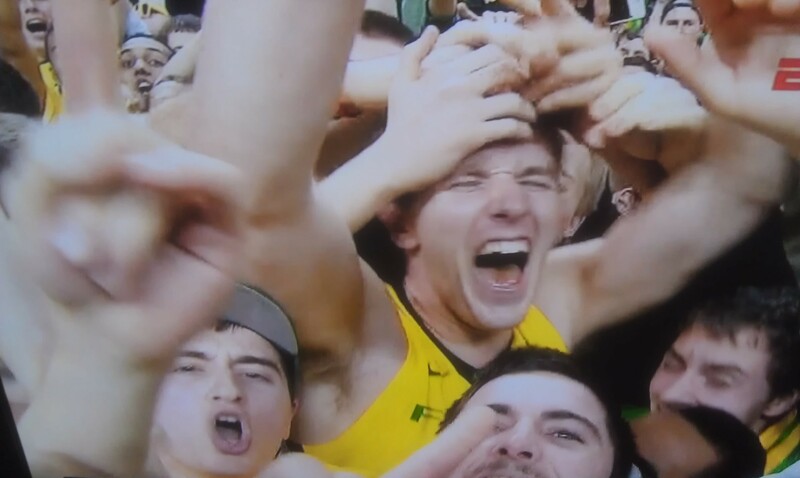 Just look at Singler’s face.